Here X marks the spot to where the elements can be shifted and the final configuration always remains the same the puzzle is solvable. 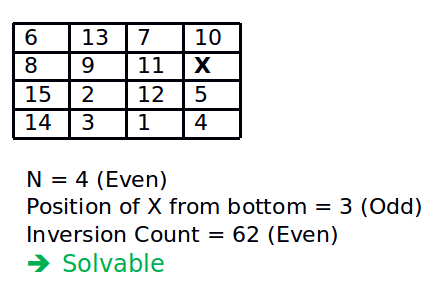 If N is odd, then puzzle instance is solvable if number of inversions is even in the input state. the blank is on an even row counting from the bottom (second-last, fourth-last, etc.) and number of inversions is odd. 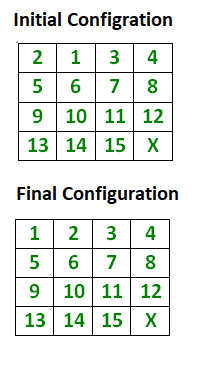 the blank is on an odd row counting from the bottom (last, third-last, fifth-last, etc.) and number of inversions is even. For all other cases, the puzzle instance is not solvable. What is an inversion here? If we assume the tiles written out in a single row (1D Array) instead of being spread in N-rows (2D Array), a pair of tiles (a, b) form an inversion if a appears before b but a > b. The above grid forms only 1 inversion i.e. (2, 1). 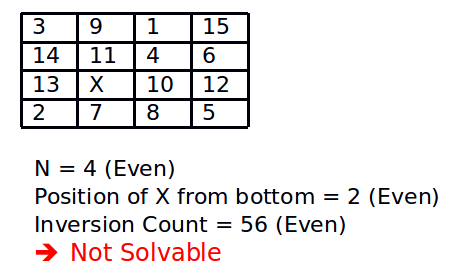 Below is a simple C++ program to check whether a given instance of 15 puzzle is solvable or not. The program is generic and can be extended to any grid width. // here is to keep code small and simple. // before j, but i > j. Fact 1: For a grid of odd width, all legal moves preserve the polarity (even or odd) of the number of inversions. Moving a tile along the row (left or right) doesn’t change the number of inversions, and therefore doesn’t change its polarity. 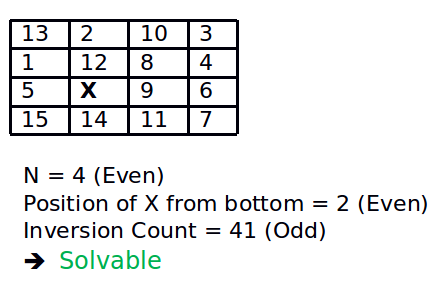 Moving a tile along the column (up or down) can change the number of inversions. The tile moves past an even number of other tiles (N – 1). So move either increases/decreases inversion count by 2, or keeps the inversion count same. Fact 2: For a grid of even width, the following is invariant: (#inversions even) == (blank on odd row from bottom). Example: Consider the move above. 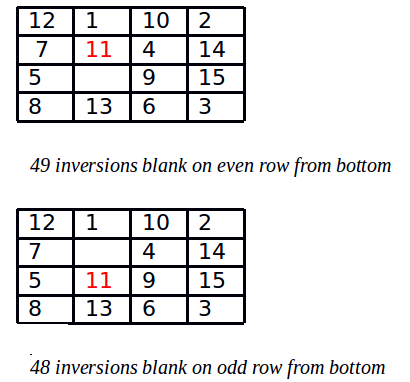 The number of inversions on the left is 49, and the blank is on an even row from the bottom. So the value of the invariant is “false == false”, which is true. The number of inversions on the right is 48, because the 11 has lost two inversions, but the 14 has gained one. The blank is on an odd row from the bottom. So the value of the invariant is “true==true”, which is still true. Moving a tile along the row (left or right) doesn’t change the number of inversions and doesn’t change the row of the blank. Moving a tile along the column (up or down) does change the number of inversions. The tile moves past an odd number of other tiles (N – 1). So the number of inversions changes by odd number of times. The row of the blank also changes, from odd to even, or from even to odd. So both halves of the invariant changes. So its value is preserved. 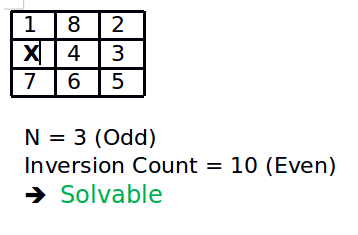 If the width is odd, then every solvable state has an even number of inversions. The initial (solved) state has those properties. Those properties are preserved by every legal move. Any solvable state can be reached from the initial state by some sequence of legal moves.